In order to enjoy the amazingly beautiful sight of the cherry blossoms, it is worth going on a one day trip out of Tokyo. 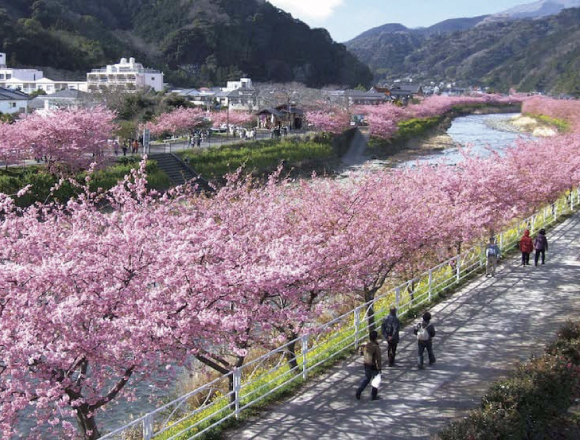 We introduce here the best sakura viewing spots in eastern Japan. The Japanese welcome the spring rejoicing, as it is the sakura (cherry blossoms) season. There is a great number of hanami (sakura viewing) spots in the Tokyo metropolitan area, but if you venture into the nearby areas, you can also find hanami spots in hot spring areas, and also a little further in Kamakura. In this article, we will introduce four unique spots in the Kanto Region, all of them offering sights that are a little different from Tokyo.